Oof. This Type-A, recovering perfectionist really hates making mistakes. These are mistakes I’ve learned to let go of and move on from quickly. Little oops moments that no one really cares about and don’t affect the bottom line in my business. Progress over perfection, right, bosses? Don't forget this marketing tip! Pin it, Keep it, Use it, Share it. 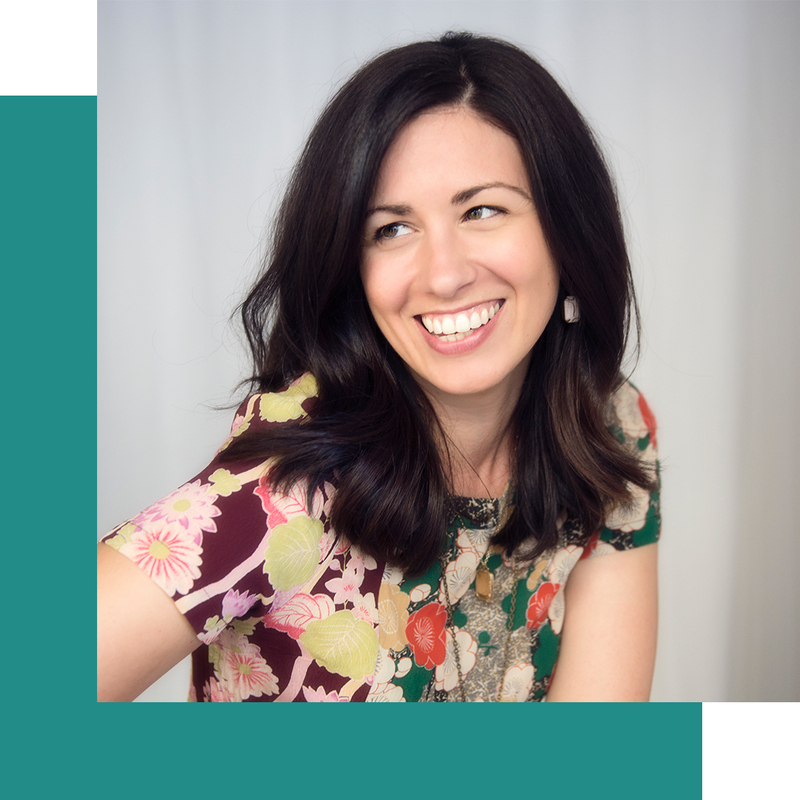 You may remember that I co-hosted the “I’m The Boss Giveaway” with a large number of awesome #girlbosses, giving away some of our signature workshops, memberships and resources for free to one lucky winner. The giveaway was geared toward entrepreneurs looking for expert advice on how to build their businesses – aka my favorite people. Ready to learn, open to new ideas, hungry for info and trusting that no one can do it alone. Well, we had about 400 awesome people sign up for this giveaway. These folks knew they were trading their emails for the chance to win. And I knew that some of them were going to be thrilled to be a part of our growing community at AJM, while others were going to unsubscribe straight away. How do you balance those disparate interests? Well, friend, I had a plan. Before I even knew there would be a single giveaway entry, I had crafted a series of welcome messages just for those new subscribers. The subject line would be compelling and provide context. The body of the first email would be warm and inviting and personal. There would be a big, fat UNSUBSCRIBE button to give them the option to opt-out immediately if they weren’t feeling my vibe. Subsequent emails would welcome them into our tribe of marketing mavens, providing easy access to our best, free resources, and assigning some marketing homework (since putting tips to action is my style). I turned off my other automated emails triggered to new subscribers, so they wouldn’t receive any welcome emails that didn’t pertain to them. But when I uploaded my 400 new email subscribers into my Mailchimp list, my everyday welcome series triggered anyway!!!!! I just spammed 400 people with something they had no idea they were about to receive, containing ZERO context for why they received it! My stomach turned over itself in somersaults. I started pacing around my standing desk, tugging on my braid. Admit I f*cked up and apologize. Follow up immediately with a second email explaining what went down and giving them that option to unsubscribe if they needed. Admitting you screwed up can be mortifying. Especially when you’re claiming to know #allthethings about email marketing, and yet, here you are, making major email marketing mistakes. I’ve always admired my friends, colleagues or contractors who own their mistakes. And the older I get, the more I realize that having the courage and integrity to admit when you’re wrong is a truly standout quality. They knew their marketing. They asked where I got their email address and scolded me for emailing without context or consent. Instead of crawling under the covers (which, believe me, I wanted to do), I wrote them back. I told them about my mistake. I explained why they were a new part of my email list and asked what they would prefer I do: own up or move on? They picked own up, and I agreed. In it, I explained what I did wrong. I told them that I had received their email from the “I’m The Boss Giveaway.” I described how I had meant to introduce myself in a targeted welcome email, but instead had accidentally spammed them with an automated email. I included a GIF of Jennifer Lawrence making a cringe face. I promised to answer all of their replies and questions, with kindness and thoughtfulness, and without taking myself too seriously. I apologized. Several people replied to my email, thanking me for my apology and telling me they’ve made email errors like this one, too. Isn’t that nice? But I have a feeling the ones who forgave my mistake and chose to stick around will have a greater respect for my teaching style, a deeper trust in my brand in the long run. 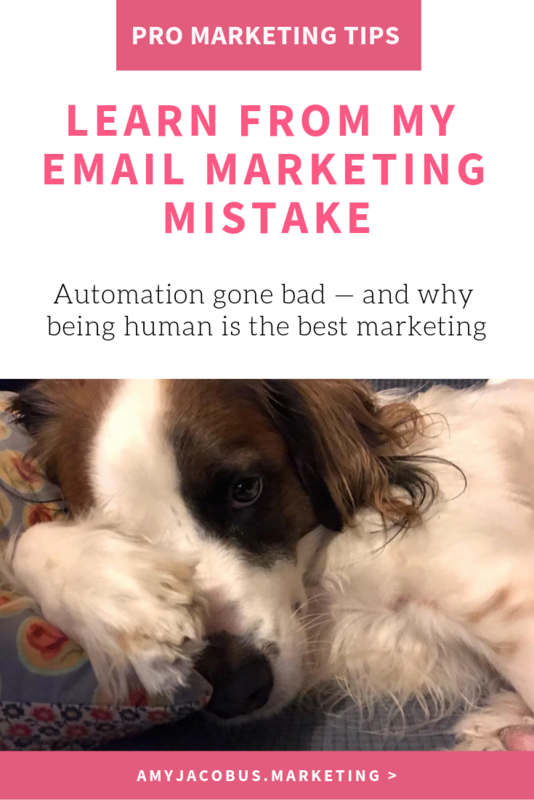 I often remind my clients there are humans at the end of their digital marketing. I do not often think about the fact that they might forget we’re human on our end, too. We should show them when we have the chance. We’ll all be the better for it. I strategize, consult and manage digital marketing and communications for small businesses and creative entrepreneurs. I’m based in Brooklyn, because I have a thing for exposed brick, cozy, local coffee shops and the can’t stop, won’t stop energy of New York. Because I work with small companies, I get the chance to really know my clients – what makes them tick and how and why they should stand out in a crowded marketplace. A lot of my clients have a smaller staff, a limited budget and are already stretched thin for time. This leads us to tailor marketing strategies and solutions to each company’s unique needs and actual capacity. Sign up to receive more FREE tips — just like this one — directly in your inbox. This is a great story, Amy. Thanks so much for sharing your experience here. The experts are the ones that ESPECIALLY make all the mistakes! There’s a saying in the community of one of my hobbies: 90% of all drops are done by jugglers. As marketers, we have to make these mistakes ourselves, so we can shield our clients from them. This adventure has contributed to your expertise!